"Oh my Goodness!! 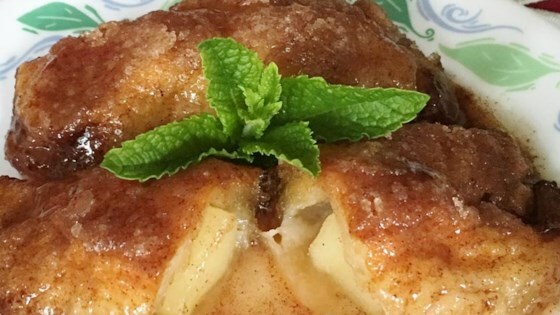 Who knew that fresh apples, crescent roll dough, and citrus soda could make such a wonderful treat!" Melt butter in a small saucepan and stir in the sugar and cinnamon. Pour over the apple dumplings. Pour Mountain Dew(TM) over the dumplings. My son-in-law is diabetic, so I reduced the butter to 3/4 stick of butter melted with 1/2 cup of Splenda sugar blend, and used Diet Mountain Dew. Wonderful! I made this tonight they are incredible. I halved the recipe and made one change. I used 3/4 cup sugar(1/2 cup white, 1/4 cup brown). Will be making this again and again.